Here is a link to my Haiku Deck Presentation on the Fast for Nonviolence. The Fast for Nonviolence – Created with Haiku Deck, presentation software that inspires. 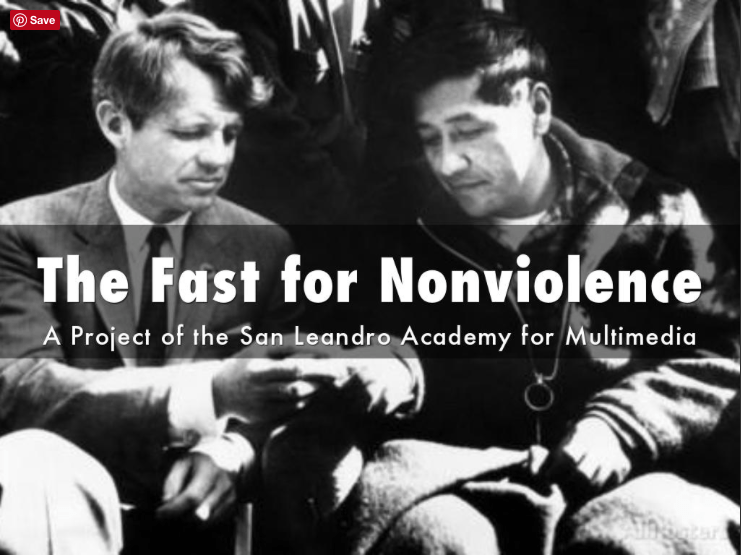 My multimedia program participates in a yearly project called the Fast for Nonviolence. Students form groups and come up with a topic of their choice around the theme of nonviolence and social struggle. These groups meet and plan out a media campaign for their projects that they launch during a day of fasting. Each project is complete with a website, a social media presence, a multimedia piece, and a presentation. After practicing their presentations students then arrange to present their cause to non-SLAM classes during their regular school day. This presentation explains some of what the Fast is all about. I created this presentation as an assignment for my Multimedia course in the Boise State EdTech Masters program. The presentation was created using Haiku Deck, a presentation program that shrinks the words on the slide depending on how many words you use in the slide. You quickly shrink your text down to unreadable size when you have over 10 words per slide, so this program works well to show presentation creators not to use too much text on a slide.